For other uses of the term, see Downs. The Downs are a roadstead (area of sheltered, favourable sea) in the southern North Sea near the English Channel off the east Kent coast, between the North and the South Foreland in southern England. In 1639 the Battle of the Downs took place here, when the Dutch navy destroyed a Spanish fleet which had sought refuge in neutral English waters. 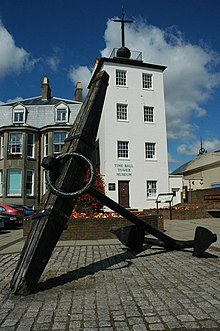 From the Elizabethan era onwards, the presence of the Downs helped to make Deal one of the premier ports in England, and in the 19th century, it was equipped with its own telegraph and timeball tower to enable ships to set their marine chronometers. The anchorage has depths down to 12 fathoms (22 m). Even during southerly gales some shelter was afforded, though under this condition wrecks were not infrequent. Storms from any direction could also drive ships onto the shore or onto the sands, which—in spite of providing the sheltered water—were constantly shifting, and not always adequately marked. The Downs served in the age of sail as a permanent base for warships patrolling the North Sea and a gathering point for refitted or newly built ships coming out of Chatham Dockyard, such as HMS Bellerophon, and formed a safe anchorage during heavy weather, protected on the east by the Goodwin Sands and on the north and west by the coast. The Downs also lie between the Strait of Dover and the Thames Estuary, so both merchant ships awaiting an easterly wind to take them into the English Channel and those going up to London gathered there, often for quite long periods. According to the Deal Maritime Museum and other sources, there are records of as many as 800 sailing ships at anchor at one time. In the present day, with the English Channel still the busiest shipping lane in the world, cross-Channel ferries and other ships still seek shelter here. "Black-eyed Susan" or "All in the Downs" is an iconic song by John Gay (1685–1732). ^ The United Kingdom Hydrographic Office Goodwin Sands/South Sand Head Assessment GS1/2006. ^ Robson, Martin (2005). The Battle of Trafalgar. Conway Maritime Press. pp. 29, 36, 158. ISBN 0-85177-979-4. ^ Harding, David, ed. (1999). Kingsdown and Ringwould: A History and Guide (3 ed.). Kingsdown and Ringwould Twinning Society. pp. 61–64. ^ "Maritime Accidents: Pride of Canterbury". Retrieved 8 September 2014. ^ "Report on the investigation into the grounding of Pride of Canterbury "The Downs" – off Deal, Kent" (PDF). Retrieved 20 March 2019.